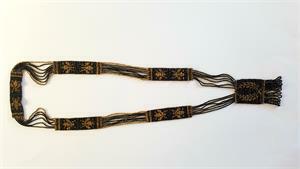 From the item listing: A stunning, rare early Victorian loom seed beaded mourning necklace with pendant. 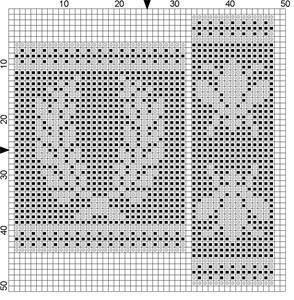 Each decorative piece is connected by 8 strands of beads. 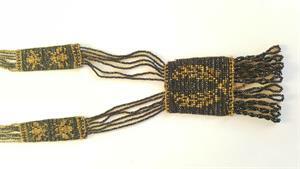 The seed beads are black faceted glass and faceted brass. The brass seed beads being those that detail the motifs of flies/bees and outside edges of the connecting strands. They also form the laurel leaf motif on the pendant. The laurel leaves on this necklace would represent peace and triumph, and worldly accomplishment, while the fly, being a popular Victorian naturalist motif was a symbol of humility. In 1860 Victorians had a passion for wearing all things insects and this necklace is a fabulous example of this vogue. Photographs supplied by ebay seller danie_pach and used by permission. Charted by Sytske Wijnsma.